Sindhu Bhairavi – Ilayaraja and K.Balachander for the first time together by Milliblog! 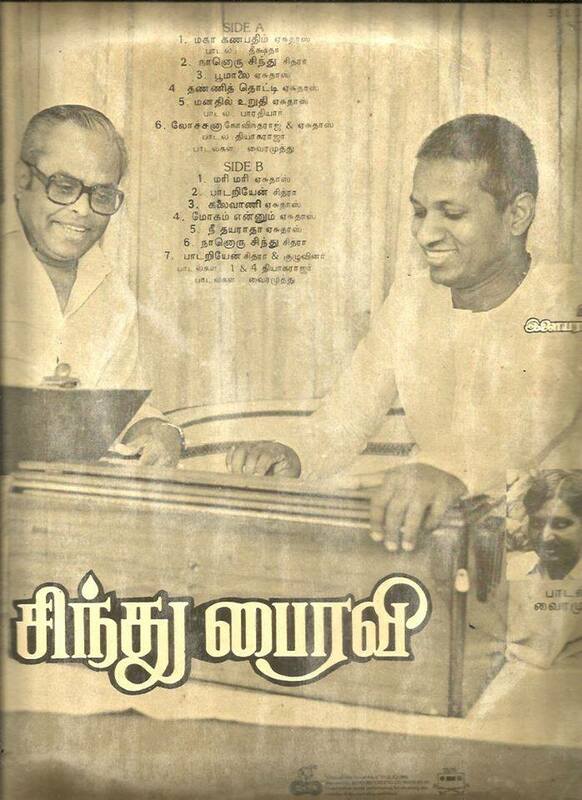 Even if @nchokkan has added this pic for pointing out the error in the album sleeve (Thyagarajar being credited for ‘Moham ennaum’ in Side B, I can’t help but reminisce on those days when K.Balachander decided to work with Ilayaraja for the first time, in Sindhu Bhairavi. 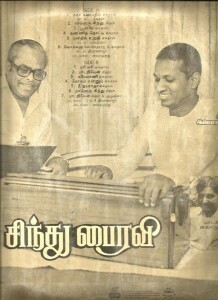 Before this film, Balachander had moved from his stable composer of that period, MS Viswanathan, to one of Ilayaraja’s associates, VS Narasimman (a fantastic violinist and a damn good composer in his own right) for films like Achamillai Achamillai (with beautiful songs like Aavaaram poovu) and Kalyana Agathigal (I love Manasukkul utkarndhu and Varavendum penne), besides Kannada films like Mugila Mallige and composer Vijaya Bhaskar for the other Kannada film Sundara Swapnagalu, in the 1985-86 period when the move to Raja finally happened. It is also amazing to know that KB has worked with Raja for barely 6 films (to the best of my knowledge – Sindhu Bhairavi, Punnagai Mannan, Manadhil Uruthi Vendum, Rudraveena, Unnal Mudiyum Thambi and Puthu Puthu Arthangal, the background music of which is supposed to caused the demise of this combination! Just consider the kind of music these films had – mindblowing seems like a lesser word to explain the kind of music this combination delivered! I was a very young school kind in Sri Rangam those days and one of the films that my otherwise conservative parents took me was Sindhu Bhairavi. My dad was a huge fan of K.Balachander and he’d eventually take me to every KB film and this was no exception. I wasn’t particularly enamored by the film back then, given its largely adult plot (I came to love it much later), but the music was a different story altogether. It’s the kind of music that grew on me more than once, and for different reasons, at different periods of time in my life. First, when I saw the film in the theater and subsequently heard the songs in the radio, I found them to be extremely pleasing and addictive. Chithra became a sensation after this and I recall seeing almost all Tamil mags going nuts over the film’s music – deservedly so. Even while the film didn’t impress me in particular since I was young, there was one scene that left me completely floored. It was the scene where Sindhu’s mother’s husband (who was a Judge, if I remember right) has a bet with his driver on a raaga and they drive to JKB’s house to settle the bet. The driver humbly seeks JKB’s permission to explain his point by singing a couple of songs including Yerikkarai mele, and wins the bet. It was a lovely little scene that has little bearing on the actual plot, but a lovely diversion that explains the film’s carnatic music soaked base beautifully. Later, when I had minimal awareness of raagas (I still have only minimal awareness of raagas by the way), I came to know how Ilayaraja used Thyagaraja’s Mari Mari Ninne, originally set in Khamboji, in Saramati, it completely blew my mind. Here was a musically untrained villager (I believe Raja is a born genius, something that happens very rarely) who is challenging the notions and limits of carnatic music and creating an uproar amongst seasoned oldies who can’t look beyond their rigid rules! That’s a masterstroke and a much needed jolt to the oldies, to force them to start looking at things afresh. I still look back very fondly at Sindhu Bhairavi, as a film (now, later when I understood the film) and more specifically for the magical music the film holds. Thanks to this wonderful picture that evoked those memories! Originally posted on Millbilog’s Facebook Page.